Way back in the summer, I started writing in this blog again. I have periodically returned to it, perhaps not as often as I would like. Moreover, in hopes of picking up the threads of my old home-cooking blog that was the very genesis of the Beech Tree restaurant, I have completed a total of ‘one’ home cooking post. Why? Well, really there is no excuse. Perhaps I simply haven’t been happy with the photographs I have snapped. Maybe I just went into hibernation mode the moment that autumn appeared and has turned into winter. Nevertheless, it is never too late to pick up where one has left off when it comes to the fine art of blogging. The Beech Tree restaurant serves food that I like to describe as ‘contemporary bistro’. We started off making high-end pub fare, but we’ve wiggled out of this box, and all that remains of that vision is perhaps a vein of British influence, be it the Isles themselves, or the influence of the Empire; that runs casually, maybe just in spirit through our ever changing menu items. So after being immersed in the finesse and composition of dishes that Chef conjures within this culinary paradigm we’ve created, there is often a longing for something completely different. For example, our kitchen staff will often discuss at length the secrets to a good burrito, the best topping for a bahn mi sandwich or where to get the hottest curries. As much as we love these foods, I think the key to a strong menu is cohesion – we can’t be all things to all people, so you won’t be seeing tacos or kimchi on our menu anytime soon (although we have been known to borrow ideas from these traditions). This is not to say that I can’t blog about these items when discussing home cooking, which to me, is as integral as what we are doing in our restaurant. I certainly encourage you to enjoy our restaurant (as often as possible), but it goes without saying that you, dear reader, will find yourself occasionally at home cooking. My goal is to simply share some of my home experiences with cooking. One wouldn’t open a restaurant without some kind of passing interest in all things gastronomic. The broth component of ramen is traditionally a dashi – this is stock, likely made using kastubushi, a type of dried fish and kombu (sea weed). Chicken can come into the equation, and as David Chang has done in his restaurant, he makes his dashi with cured pork belly. My dashi had no seafood component to it and instead consisted of duck and chicken carcasses. Very strange, but it was what I had on hand. Chicken provides a light, familiar flavour to stocks, duck on the other hand, lends a roasty, dark and very meaty flavour. I was hoping to mimic the bacon dashi somewhat with this concoction. The stock was simmered with ginger, star anise and some basic stock veg. I finished with an adjustment with soy, rice vinegar and salt to my taste. The results were good – perfectly acceptable for a decent noodle bowl. It lacked that fishy je ne sais quoi that kombu brings, but it’s all good. Next, I needed to address my take on kimchi. Traditional kimchi is made with light green cabbage, fish sauce and Korean chillies among other ingredients. It is fermented over time to get quite funky. I didn’t have the time nor the proper cabbage, so I took some red cabbage, cut it thinly, added a thinly cut onion, a julienned cucumber, a small dice of ginger and garlic and then tossed it all with a table spoon of sugar and about the same amount of salt, I added cayenne for heat. When all the ingredients were nicely coated with the sugary-salty-spicy components they instantly start to macerate in their own liquids – what would be typically called a ‘quick pickle’. The salt and sugar will almost ‘cook’ the vegetables until they are soft, palatable and quite tasty- the flavour profile was very similar to real kimchi, but so much more colourful! Then I threw a one kilo slab of raw, skinless pork belly into my pressure cooker with some water, a bit of the dashi broth, some stock veg, a stick of cinnamon, some cloves and a few generous glugs of dark soy (you will need enough liquid to cover the meat). I cooked that under high pressure for about half an hour or until the belly was soft and yielding. I got it out of the braising liquor and onto a tray under the broiler. This would give the belly some much needed browning and caramelization, echoing the ‘roasty’ flavour of the dashi along with rendering down a bit more of the fat. The rest was basic assembly. Soft boil a few eggs, toss your quick pickle kimchi with some rice wine vinegar to temper the sugar and salt, and cook off your store-bought fresh ramen noodles as per the instructions on the package. 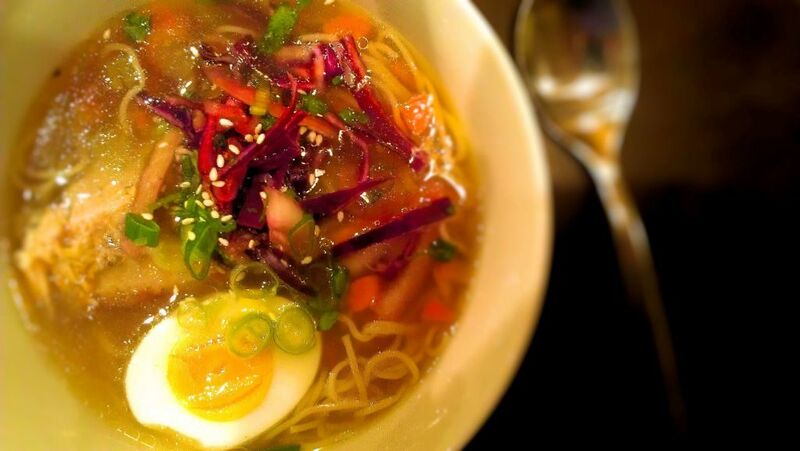 Get a portion of the noodles in a stupidly big bowl, then layer the garnish around; a chunk of succulent pork belly, a half or two of soft boiled egg, and ladle in the ducky dashi to just cover the contents. Top with a some of the kimchi- like concoction, some scallions and whatever else you like. Eat noisily and messily with chopsticks. A humble take on a humble dish – and not likely to appear on the Beech Tree menu anytime soon!